← Didn’t we have a LUVVERLY time the day we went to Winchcombe! We’re getting ready for our TWO Outer Circle Tours in September. The route hasn’t changed much in the last 86 years! But what we can see has. Much of the route was originally in open countryside and many of the buildings that we talk about on our Audio Tours have gone – so have the trams that at one time crossed the Outer Circle. On the Tour we also make reference to some of the significant buildings near to the Outer Circle that have helped shape our city – some of which date back to the 16th & 17th centuries. On our tour we usually provide our passengers with a map of the route and we have been preparing a new one for September. The new map has pictures of some of those things that can’t see from the bus, or have disappeared altogether. Tolkien’s Two Towers are only about a mile away from City Road, but are obscured by the trees in Summerfield Park. In the park at one time stood Summerfield House, but that was demolished in 1886. On the other side of City Road we would have passed the back of M&B’s Cape Hill Brewery which was connected by rail via a branch from the Harborne Railway line. Both the brewery and the railway here have gone, the brewery being replaced by housing. We have tried to capture some of these departed features of our city’s landscape in the map, including photos of a few Birmingham trams. We’ve had permission to use most of the tram photographs by Mark Norton whose father DJ Norton, a professional photographer, made a wonderful photographic record of Birmingham (and a few other places) in the 1950s & 60s. Mark’s father sadly died from an asthma attack at the age of 35 before Mark was born. Amongst the photographs were the last days of Birmingham’s trams, the building of the inner ring road and the demolition of the original New Street Station. It is a haven of memories for Brummies of a certain age and is well worth a look. Mark is putting his father’s photographs on a website and we can recommend a visit to www.photobydjnorton.com to have a look round. Through the generosity of our passengers we normally make a donation to a couple of charities and in September we will be giving to Asthma UK in memory of DJ Norton. 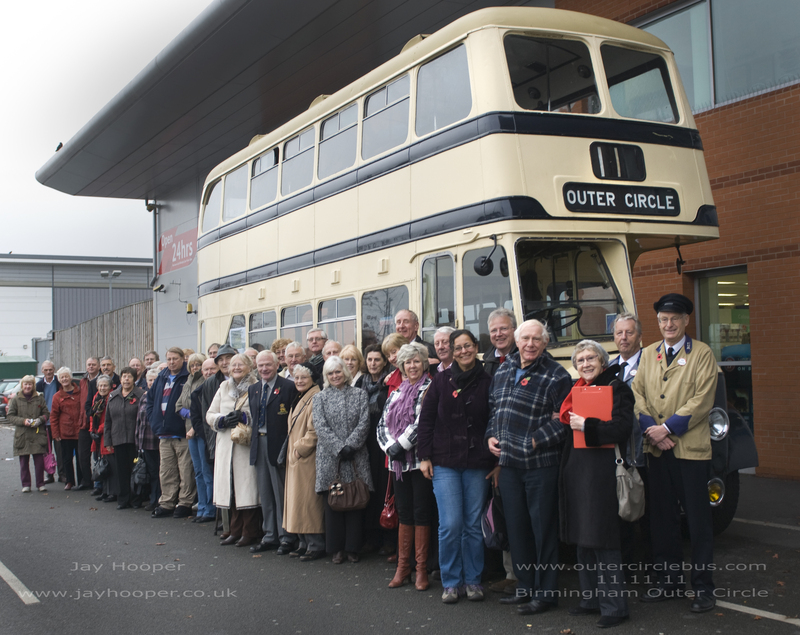 Our two Outer Circle Tours in September are now full, but if you want to take a trip down memory lane on the Outer Circle next year make sure that you are on our mailing list or keep visiting us here. This entry was posted in Historic Bus Tours, Outer Circle Bus Trips, Vintage Bus trips in 2012, Wythall Transport Museum and tagged 11-11-11, 1950s Birmingham Corporation Double-Decker, Birmingham City Transport, Charity, Guided Tour, Guy Arab IV, Historic Bus Tour, Photo by DJ Norton, Wythall Transport Museum. Bookmark the permalink.